Running Time: 2 hr. 24 min. There’s adequate blame to go around over the 2012 Benghazi attacks. Much lies with U.S. government officials who didn’t adequately appreciate threats of violence or repair security lapses that might have prevented the deaths of four Americans, including Ambassador Christopher Stevens, in Libya on the evening of September 11, 2012. There are also the politicians and pundits who, for the sake of scoring cheap political points, have eschewed sober assessment for costly grandstanding, appropriating these same solemn deaths into a hashtag. 13 Hours: The Secret Soldiers of Benghazi lies somewhere between Benghazi and #Benghazi. Director Michael Bay, a renowned action filmmaker with avowed conservative politics, is both an obvious and dubious choice to shepherd this story to the silver screen. At a protracted 2-hour 24-minute running time, 13 Hours takes its political potshots, some provocative others specious—the notion that six CIA contractors caught in the crosshairs of a nocturnal firefight to the death received real-time reports from back home, saying State Department officials were blaming the attack on an anti-Muslim video, doesn’t comport with reality or common sense. Those going to see 13 Hours to rekindle their political fervor miss the film’s only virtue. Bay breaths life into the catchphrase, elucidating a time and place account of the nighttime assaults on an American diplomatic compound and, later, a CIA annex one mile away. The film lionizes the CIA soldiers who executed a daring rescue mission into the diplomatic compound, then fought back armed insurgents at their annex throughout the night against overwhelming odds. It indicts bureaucratic missteps. It captures a surreal world where it’s impossible to differentiate friend from foe, while paying respect to armed Libyans who came to aid of the besieged Americans. The action scenes are riveting and astutely frame. Bay revels in military rhythms, from its vernacular to the resonance of distinctive armaments. He also pierces the fog of war so the audience can comprehend even the most chaotic circumstances. But this being a Michael Bay film, character development is overrun by spectacle, a regrettable lapse in a film of this sort. 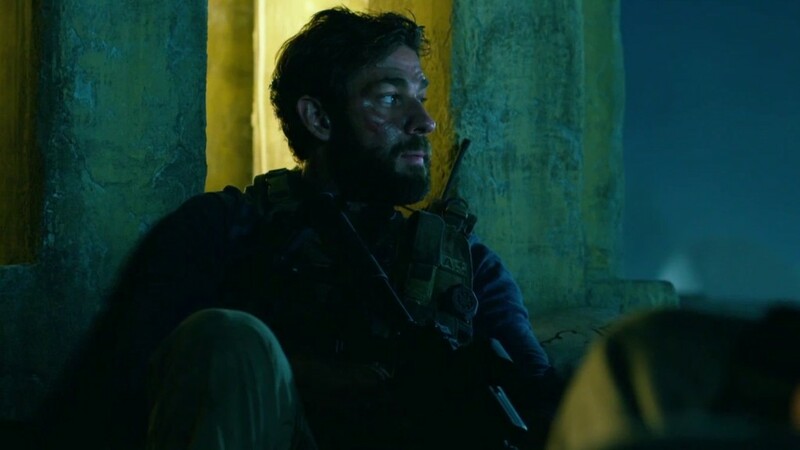 CIA contractor Jack Silva, played by John Krasinski, is the only semi-fleshed out character. The rest are archetypes with nicknames, from strapped paramilitary men with their tatts and AKs, to sniveling pencilpushers in distress. There’s little nuance navigating of the shades of gray in American interventionism and diplomacy. Heck, the purpose of the CIA operatives in Benghazi is never clarified (perhaps intentional on Bay’s part). This is the third straight year the Martin Luther King holiday weekend has seen the wide release a military-centric, jingoistic film, after American Sniper in 2015 and Lone Survivor in 2014. 13 Hours figures to generate boffo box-office returns. Unfortunately, many in the crowd will be there to affirm rather than learn.